During the month of May, 1935 the University Gallery was host to some animated visitors. 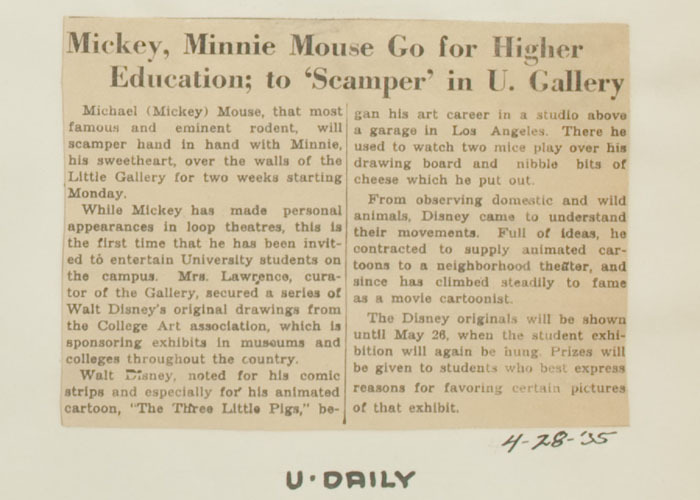 As described in the May 12, 1935 article in the Minneapolis Tribune titled, “Mickey Mouse Goes ‘Arty’ in University Exhibition,” the gallery exhibited 50 black and white drawings and 48 color drawings from the Disney studio in California, which were loaned to the gallery by the College Art Association. The drawings illuminated the process of animation, and showcased celluloid character drawings superimposed over landscape drawings on paper. During the run of the exhibition, original Walt Disney short films were also shown. A gallery report indicated that “projection apparatus” was brought to the gallery and from time to time Mickey Mouse and Silly Symphonies cartoons were played. This was in addition to frequent talks given by the Department of Visual Education on the methods of animation.